With the Canon iR-2018 & iR-2022 Digital Copiers, even smaller workgroups can afford the sophisticated document production features needed for success. Capable of producing up to 1200 X 1200 dpi output at speeds to 18 and 22 pages per minute, respectively, these Canon iR-2018 & iR-2022 powerful systems deliver the benefits of digital copying, network printing, color scanning and optional fax features. With the Canon iR-2018 & iR-2022 Digital Copiers, the ability to work smarter is well within your reach. Even with their advanced features, these Canon iR-2018 & iR-2022 models couldn't be easier to administer with simplified tools for managing device access and helping to protect the security of your confidential information. Whether a beginner or an advanced user, these Canon iR-2018 & iR-2022 Digital Copiers are so easy to use and include electronic documentation to help facilitate operation. 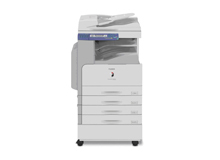 The Canon iR-2018 & iR-2022 models have a small footprint, so you can conserve valuable office space. Built upon Canon's imageChip (Concurrent Hyper Intelligent Platform) lite architecture, the Canon iR-2018 & iR-2022 devices have been designed with fast multifunction processing and concurrency. The architecture includes a powerful processor and 128MB of RAM (expandable o 256MB) to provide the resources needed to simultaneously handle the workflows of multiple users while maintaining the rated speed. 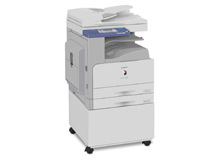 The Canon iR-2018 & iR-2022 models come standard with paper capacities of 500 and 250 sheets with a 80 sheet stack bypass tray. For greater capacity, additional cassette options can be added for a five way feeding system of up to 1,080 sheets. Media sizes of up to 11" X 17" can be handled in all paper trays. The Canon iR-2018 & iR-2022 models create copies and electronic versions of your original documents. Individual pages can be easily scanned from the platen glass or achieve higher productivity with the optional 50 sheet duplexing automatic document feeder for higher volumes of even double sided originals. Regardless of your experience level, the functions of the Canon iR-2018 & iR-2022 Copiers are highly intuitive. An easy operation guide provides step by step instructions on how to operate the device main functions. Documentation is CD based and features search tools to find answers quickly and easily.